WASHINGTON, DC, January 24, 2011 (ENS) – Recognizing “increasing disaster risks due to climate change and rapid urban development,” the World Bank and South Korea’s National Emergency Management Agency on Friday signed an agreement to strengthen cooperation, and facilitate international partnership for disaster risk reduction and climate change adaptation. “We embark on a longer term partnership for reducing natural disaster risks faced by disaster prone countries in Asia and Pacific,” said Dr. Yeon-Soo Park, NEMA’s administrator. Park said a Centre of Excellence will be created in Korea “for supporting countries on disaster risk reduction.” The partners also will create a web-based regional platform for disaster risk reduction and climate change adaptation. The Asia Pacific region is extremely vulnerable to the impacts of natural disasters. In East Asia and Pacific alone, over the past two decades, floods, typhoons and earthquakes have affected two million people, killing nearly 90,000 and causing damages of more than US$151 billion. This kind of action is needed urgently in view of the fact that last year the world experienced the highest number of disaster-related casualties in at least two decades, the United Nations’ top disaster reduction official said today at UN headquarters in New York. “Unless we act now, we will see more and more disasters due to unplanned urbanization and environmental degradation. And weather-related disasters are sure to rise in the future, due to factors that include climate change,” said Margareta Wahlstrom, who heads the UN International Strategy for Disaster Reduction, the UN body that coordinates efforts to achieve reduction in disaster losses and build resilient nations and communities. Some 373 natural disasters claimed the lives of more than 296,800 people last year, affecting nearly 208 million people and costing nearly $110 billion, according to annual data compiled by the Centre for Research on the Epidemiology of Disasters, CRED, of the Universite catholique de Louvain in Belgium, Wahlstrom said. The January 12, 2010 earthquake in Haiti killed more than 222,500 people, while the Russian summer heat wave caused about 56,000 fatalities, making these events the two deadliest of the year. “These figures are bad, but could be seen as benign in years to come,” said Wahlstrom, who also serves as UN Secretary-General Ban Ki-moon’s Special Representative for Disaster Risk Reduction. “It’s critical for local governments, city leaders and their partners to incorporate climate change adaptation in urban planning,” Wahlstrom said, stressing that disaster risk reduction is no longer optional. CRED’s data shows that for the first year, the Americas were the world’s worst affected continents in terms of fatalities, with 75 percent of total deaths caused by the earthquake in Haiti. Europe was the region with the second highest number of deaths, with the heat wave in Russia accounting for nearly a fifth of 2010’s total fatalities. Other extreme climate events in Europe included Storm Xynthia last February, floods in France in June and the extreme winter conditions all over Europe throughout December. Asia experienced fewer disaster-related deaths with 4.7 percent of total fatalities, but remained the region most prone to natural disasters. An estimated 89 percent of the total number of people affected by natural disasters last year resided in Asia. Five of the 10 most deadly disasters occurred in China, Pakistan, and Indonesia. Earthquakes killed almost 3,000 people in China in April and 530 people in Indonesia in October. Between May and August, floods killed more than 1,500 people in China, and another 1,765 were killed by mudslides, landslides or rock fall triggered by heavy rainfall and floods in August. Nearly 2,000 people died in Pakistan’s massive floods. Flood-related destruction in Pakistan was estimated at $9.5 billion. 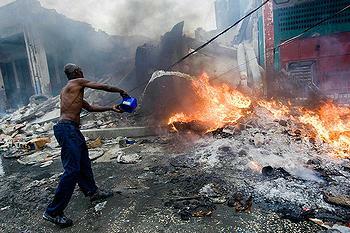 The Haiti earthquake caused damage worth $8 billion, according to the CRED data. The costliest event in 2010, however, was the earthquake in Chile in February, with damages valued at $30 billion. 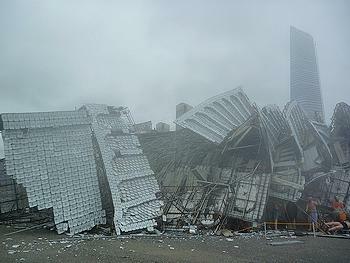 The other two years when natural disasters caused higher losses were 2005, when damages from Hurricanes Katrina, Rita and Wilma alone amounted to $139 billion; and 2008, when the earthquake in Sichuan, China, caused $86 billion worth of damages, a figure than brought the total losses for that year to about $200 billion.